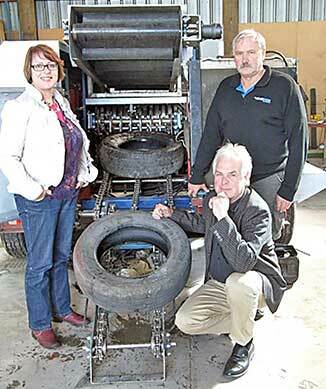 Ōtaki Ward Councillor Penny Gaylor is shown the portable tyre shredder by Entyre’s Reiner Wenzel (crouching) and Nigel Pritchard of Riverbank Engineering. More than 50 jobs could be created in Ōtaki when the Entyre rubber recycling plant gets fully into production, converting a sizeable chunk of New Zealand’s waste tyres into products such as mats for dairy farms. Six staff are already working for the company, based at Ōtaki’s Clean Tech Tower, but the workforce will grow in August when the company begins its recycling work in earnest. That is when the first of the 12 innovative tyre shredders built in Ōtaki by Riverbank Engineering will start to reduce tyres to small strips that are easily transported back to Entyre’s factory by container for further processing. By 2016 the company hopes to be capable of processing about 40% of the 4.5 million tyres discarded annually in New Zealand. There is no waste. The process recycles 100% of the tyre – 85% rubber, 12% steel and 3% fibre. The steel is collected and cleaned then sent to New Zealand steel mills for reuse. The fibre is compacted and exported to make fleece jumpers and other products. Entyre managing Director Reiner Wenzel has extensive experience in this technique (devulcanisation) starting in 1989 when he began to design and build tyre recycling machinery. He also worked out practical and cost-effective ways to reuse the material, including manufacturing floor matting and playground components. This led him to set up companies in Switzerland, Germany, China, Austria, Spain, USA and Australia. Why bring the concept to Kāpiti? Reiner says he loves the area and the lifestyle. Plus, there has been fantastic support available at every stage. Council awarded the company $31,000 from its waste reduction grant budget to help kick start the building of the first tyre cutter, seeing the merit of reducing the tyre waste in landfills and encouraging recycling. “We are working with the Council to help grow their forward-looking Clean Tech initiative. The Clean Technology Park is a new commercial business centre supporting businesses to run in a more environmentally-friendly and sustainable way, which fits in with our company philosophy,” says Reiner.